Polygala Linn., Sp. Pl. 701. 1753. Gen.Pl.ed.5:851.1754; Boiss., Fl. Or. 1:468. 1867; A.W. Bennett in Hook. f., Fl. Brit. Ind. 1:200-206. 1872; Chodat in Mem. Soc. Phys. Hist. Nat. Geneve, 31:(2, No. 2): 1-500.1893; Post, Fl. Syr. Pales. and Sinai, 120.1896; Cook, Fl. Bomb. 1 (1) :59.1901; Collett, Fl. Siml. 42.1902; Kashyap, Lah. Dist. Fl. 35.1936; Parsa, Fl. Ir. 1:971.1951; J. Cullen in Davis, Fl. Turk. 1:533.1965; Jafri, Fl. Kar. 189.1966; Adema in Blumea 14:253-356.1966; J. McNeill in Tutin et al, Fl. Eur. 2:231.1968. Annual or perennial herbs, glabrous or ± pubescent with simple unicel¬lular upcurved hairs. Leaves usually alternate, exstipulate. Racemes terminal or lateral. Sepals 5, usually persistent. Petals 3, ± united below. Stamens usually 8, ± united into a staminal sheath and adnate to the petals. Ovary 2-locular, ovule one in each loculus. Capsule 2-seeded, loculicidal, compressed. Seeds ± pilose, strophiole usually 3-lobed. A large and difficult genus of about 600 species, distributed throughout the world except New Zealand, Polynesia and arctic zone; represented in West Pakistan by 8-10 species, unevenly distributed throughout the country, greater concentration of species being found in the Punjab and Kashmir. Polygala abyssinica R.Br. ex Fresen. Polygala hohenackeriana Fisch. and Mey. Polygala abyssinica var. gerardiana (Hassk.) Chodat = Polygala abyssinica R.Br. ex Fresen. Polygala brachystachya DC. = Polygala arvensis Willd. Polygala chinensis auct. non Linn. : A.W. Bennett = Polygala arvensis Willd. Polygala erioptera var. vahliana (DC.) 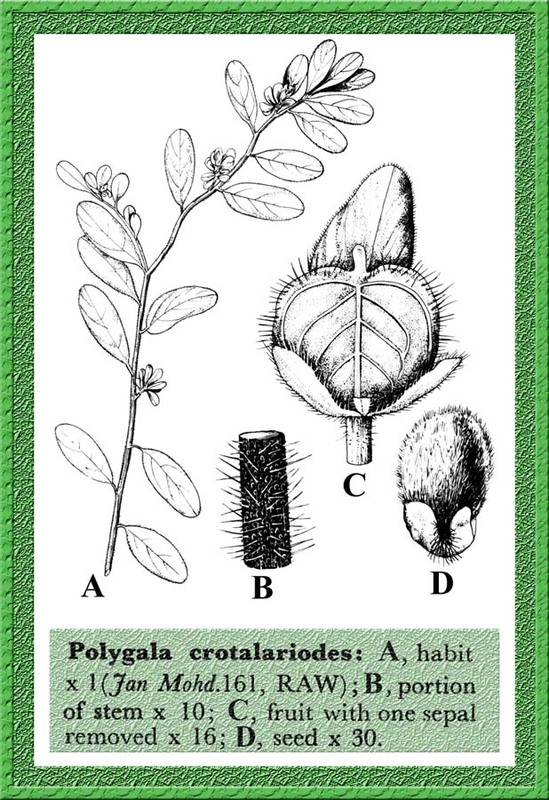 Chodat = Polygala erioptera DC. Polygala gerardiana Wall. ex Hassk. = Polygala abyssinica R.Br. ex Fresen. Polygala hohenackeriana var. stocksiana (Boiss.) Boiss. = Polygala hohenackeriana Fisch. and Mey. Polygala monopetala Camb. = Polygala sibirica Linn. Polygala sibirica var. monopetala (Camb.) Chodat = Polygala sibirica Linn. Polygala stocksiana Boiss. = Polygala hohenackeriana Fisch. and Mey. Polygala vahliana DC. = Polygala erioptera DC.